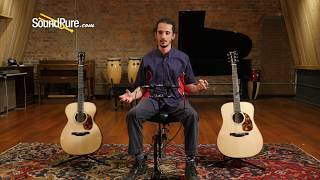 Boucher's Bluegrass dreadnought in Mastergrade Addy and Brazilian back/sides! Flatpickers, prepare yourself and approach--you may not be ready for this one. While the light weight, feels-like-it's-hardly-there (in the best way) neck, and immaculate fit and finish all give you the feeling of coming home, the voice that comes out of this instrument will take you far, far away from wherever you might be. It seems to comprehend it all--everything from a bass that rumbles and roars like a train to trebles that float and glisten like birdsong on morning air. It can glow and shimmer with natural reverb and intricate overtones or drive and cut with diamond-hard attack and clarity. Bring down crashes of thunder and lightning or draw tender blooms from thin air. This guitar comes with unparalleled power--use it well! 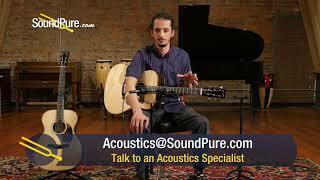 In this video, Sound Pure acoustic guitar specialist Barrett Brooks plays a Boucher Bluegrass Goose Addy/Brazilian Dread #BN-1005-DB. Boucher Guitars’ location in the heart of the Canadian Appalachians gives us unique access to raw materials: we produce and supply nearly 12,000 sound boards per year, crafted exclusively from Adirondack spruce. This local sourcing allows us to meticulously select the best wood for our guitars; Adirondack spruce is a rare and sought-after material on the world market, meaning that Boucher Guitars has a trusted relationship with the world’s best-known suppliers of exotic materials. This allows us to provide guitars made of rare and unique materials, by procuring the finest raw materials in the world. Guitarists worldwide–including nationally and internationally-known artists–trust Boucher Guitars to provide them with the finest instruments available, and we are proud to have earned their trust. Visit our Artists section to learn more, and to read about the unique relationships between musicians and their guitars! A team of professional artisans and luthiers (guitar makers) stands behind every Boucher guitar. We are proud to design and create fine instruments in the time-honoured tradition of Quebec craftmanship. Our passion and knowledge translate into a meticulous work ethic: our craftspeople are committed to creating high-performance instruments of superior quality, while also focusing on the highest level of finish and detail work and our exclusive and time-tested bracing styles. This attention to detail results in a guitar that exceeds our customers’ expectations in every way. We can honestly say that every Boucher guitar exemplifies strength, volume and precision, to an extent that we believe is unequaled in the guitar world. The sound and beauty of a Boucher guitar is truly an appeal to the senses: try one, and from the first chord, we think you’ll agree!